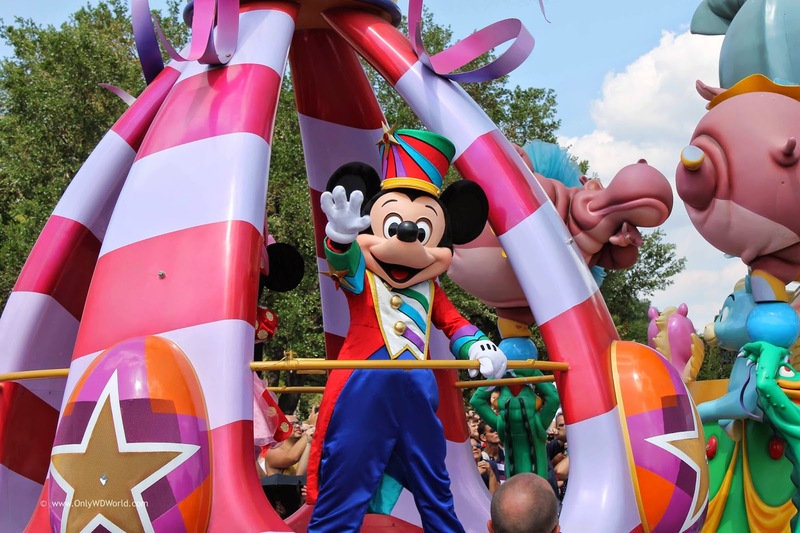 There are few things better than a Parade at the Magic Kingdom in the Walt Disney World Resort. 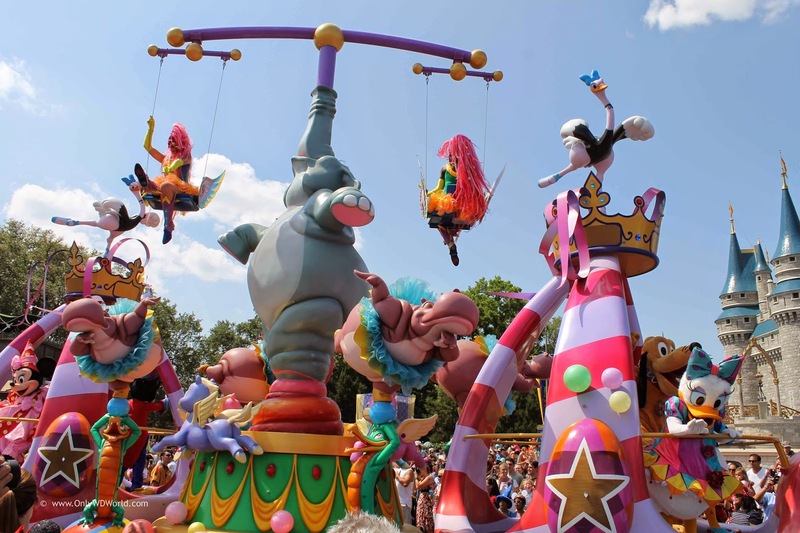 The newest 3:00pm parade called the Festival Of Fantasy Parade may be the best Disney Parade ever! 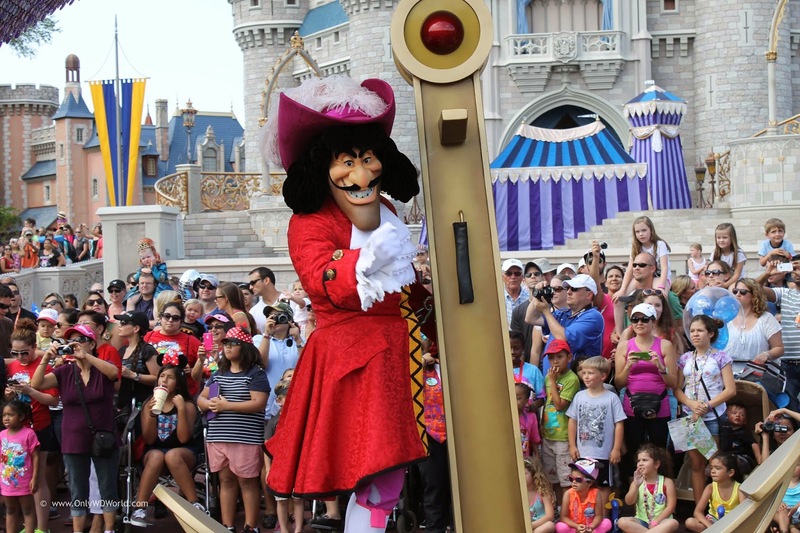 The featured afternoon parade at the Magic Kingdom always draws a crowd. 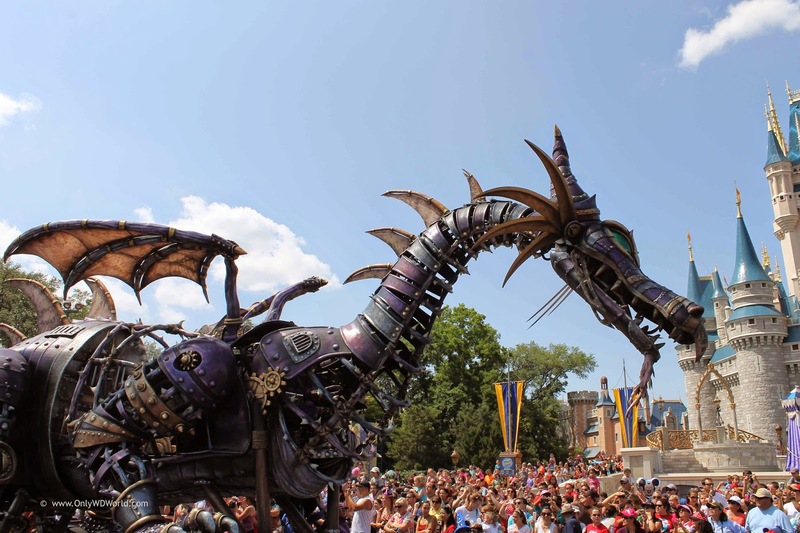 The newly launched Festival Of Fantasy Parade gives Disney World guests a great reason to line the streets in anticipation of awe inspiring floats and chances to see their favorite Disney Characters. 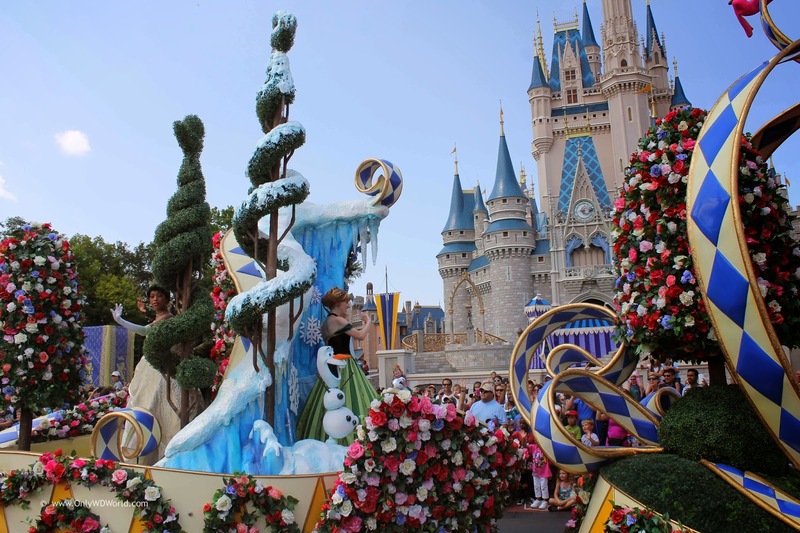 The initial float in the parade features Disney Princesses. 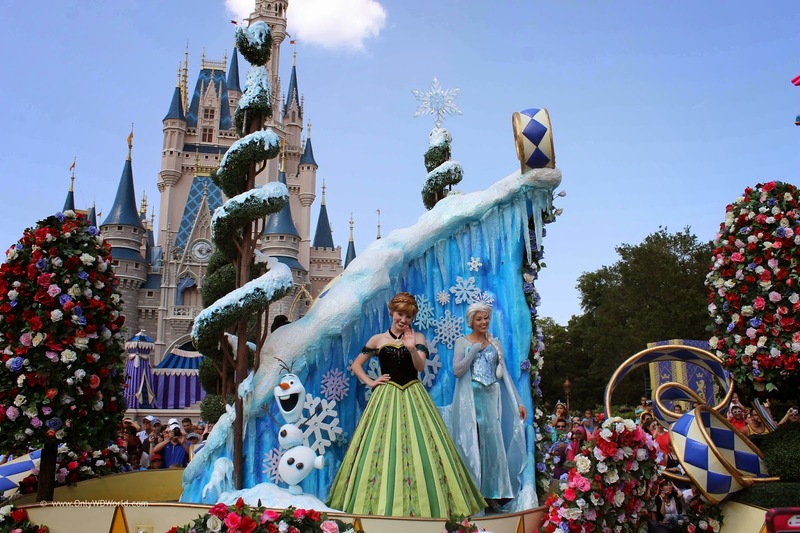 It originally was not planned the amazingly popular sisters Anna & Elsa from Frozen, but they could not be denied. 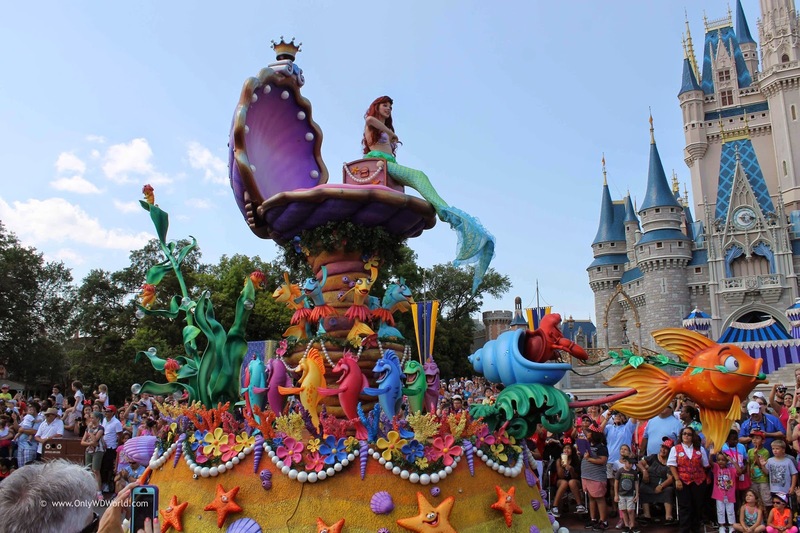 We loved the fact that this was a 3 section float that had distinct areas that brought 4 different Disney Animated Princess Movies together. 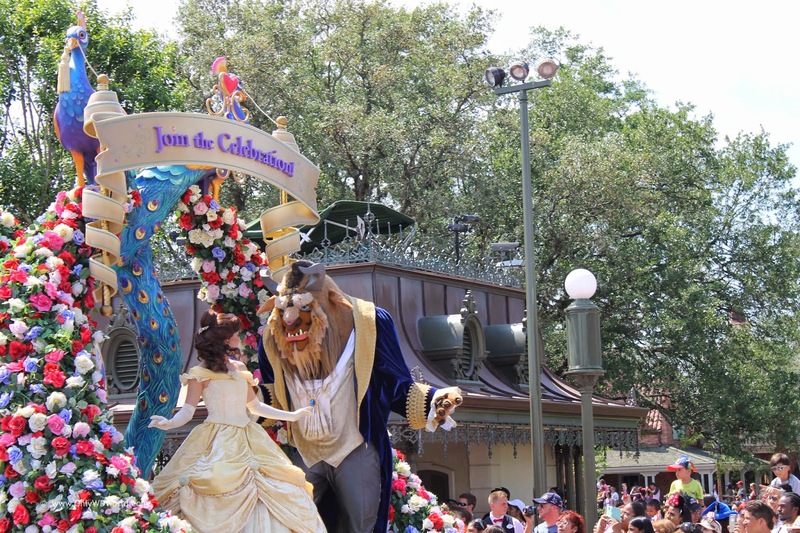 The first section was dedicated to Beauty & The Beast, with Belle and the Beast himself appearing on the float among a sea of flowers. 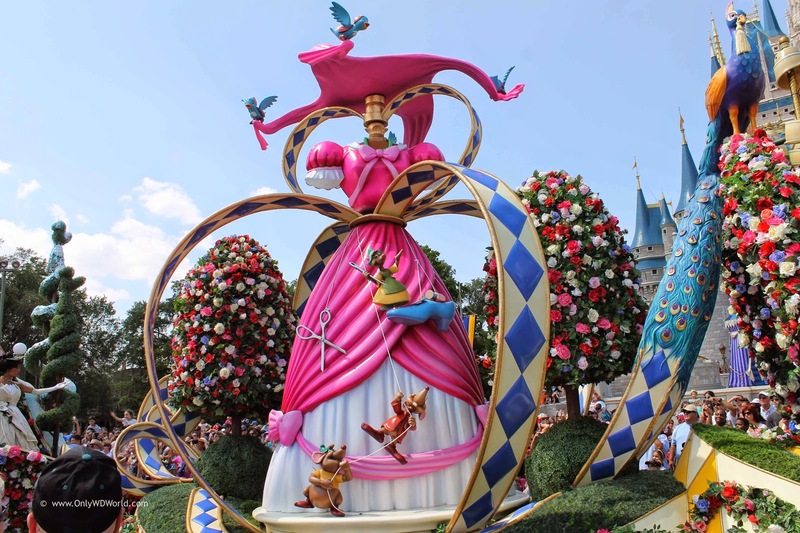 The second section belongs to Disney's favorite princess, Cinderella. 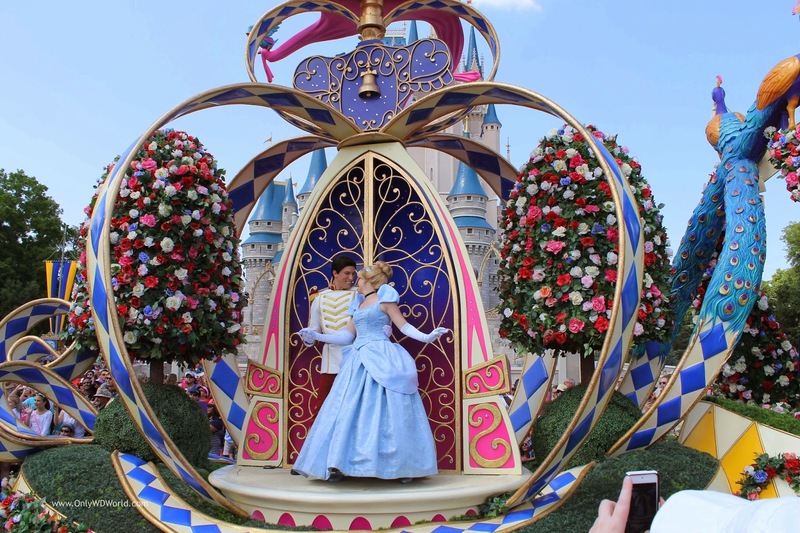 We loved how this rotating section features a dress from the animated movie on one side and Cinderella and Prince Charming on the other. 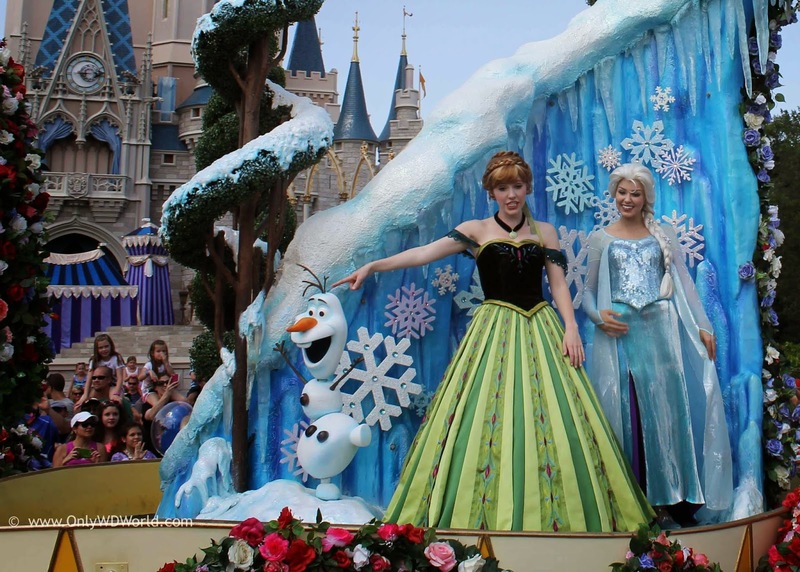 The 3rd section featured Princess Tiana on one side and the ever popular Princess Anna, Queen Elsa, and Olaf from Frozen on the other. 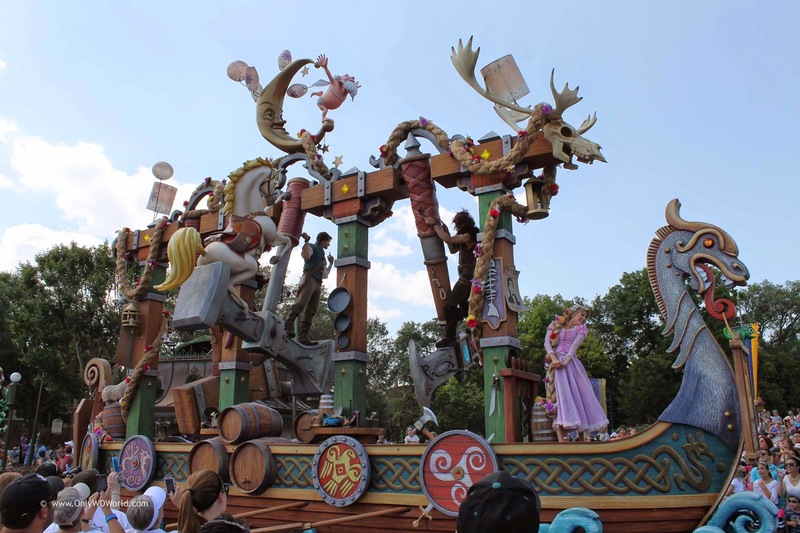 In perhaps the most amazing Disney Float ever, Rapunzel and Flynn Rider amaze the crowds with this kinetic boat shaped float that features elements that swing in giant arcs from side to side as the float proceeds downs the streets. 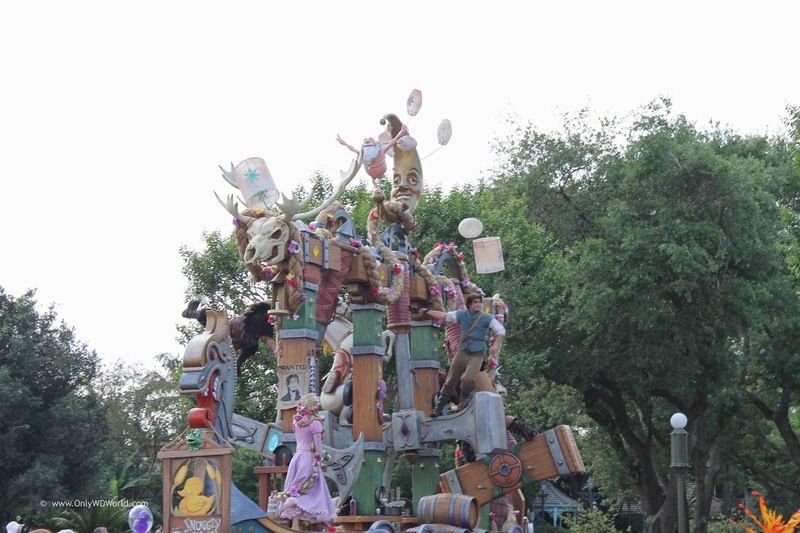 Unfortunately pictures do not do this one justice. 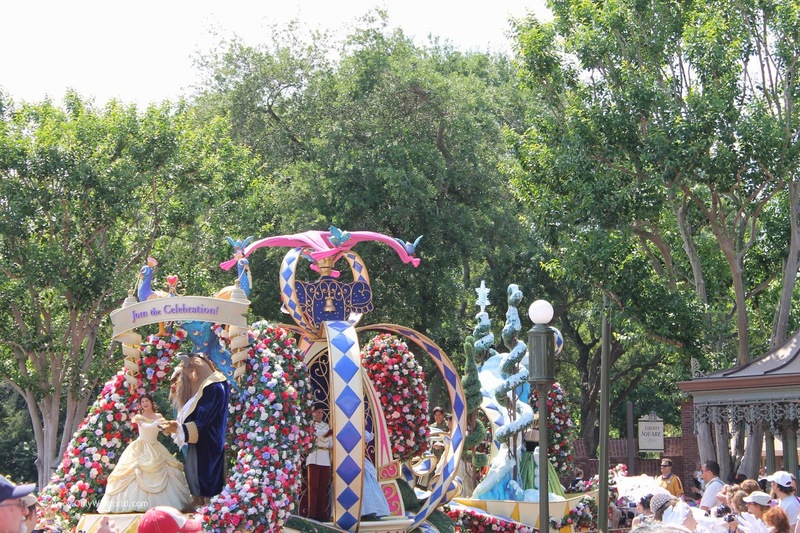 You really have to be standing at street level to appreciate the size of this float and the spectacle of the swinging Flynn Rider. 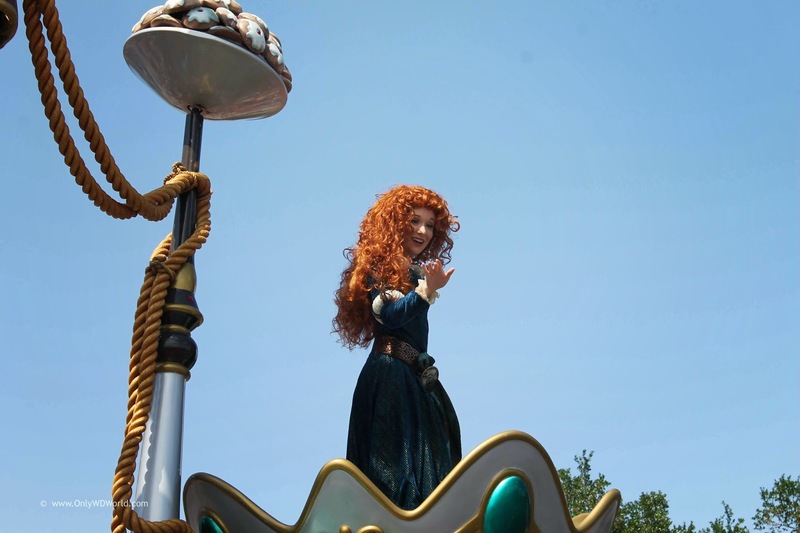 Ariel has a regal perch as she makes her way through the Magic Kingdom. 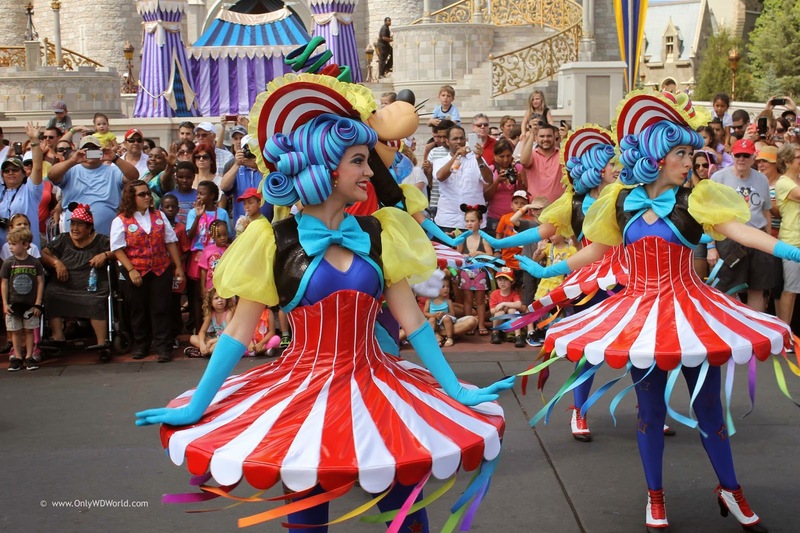 She is joined by an amazing array of colorfully clad dancers. 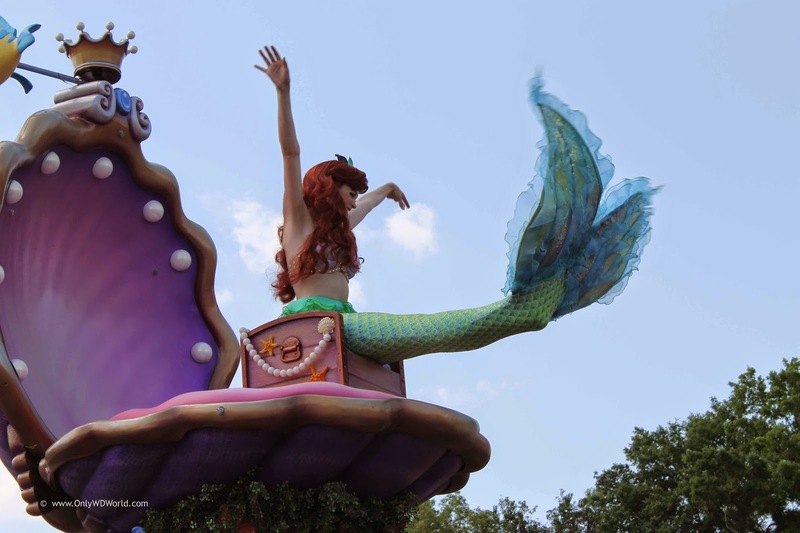 If not for the other amazing floats, this Little Mermaid would gt more attention. 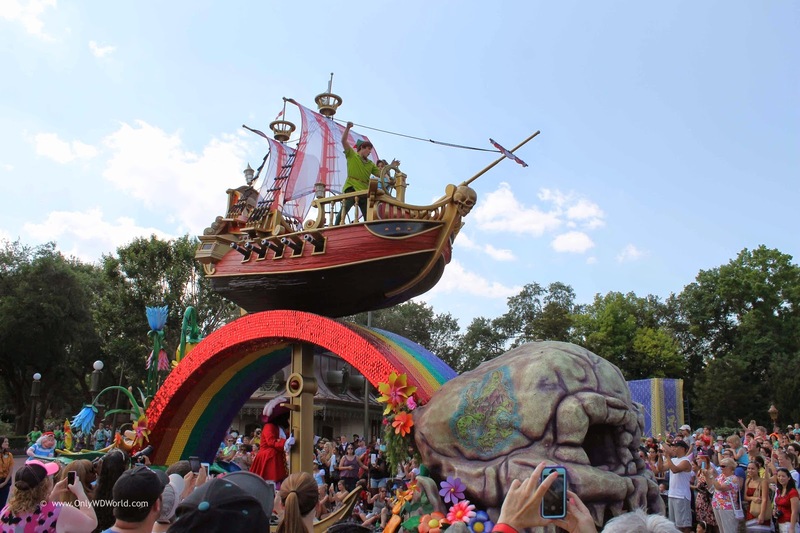 Peter Pan, Wendy, Captain Hook, and Tinker Belle make their way through the parade on yet another incredible float that will get your attention. 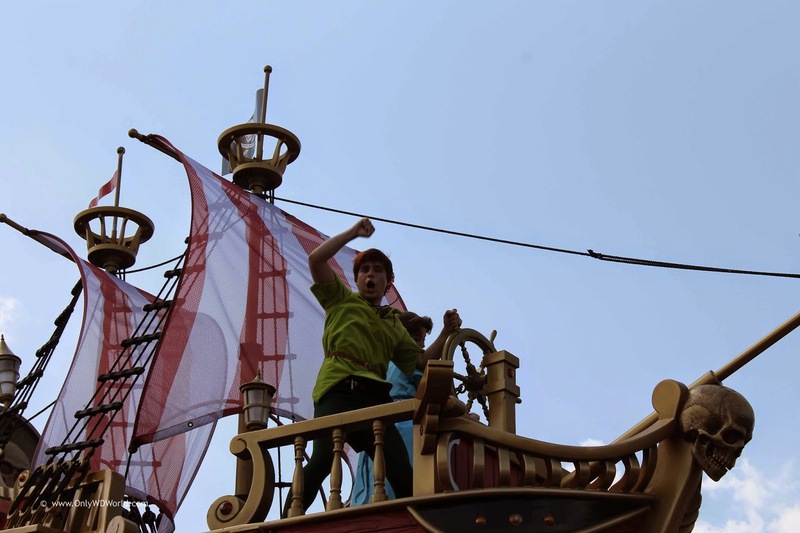 Peter Pan and Wendy are way up high in the ship above the rainbow, while Captain Hook is down below on an anchor. 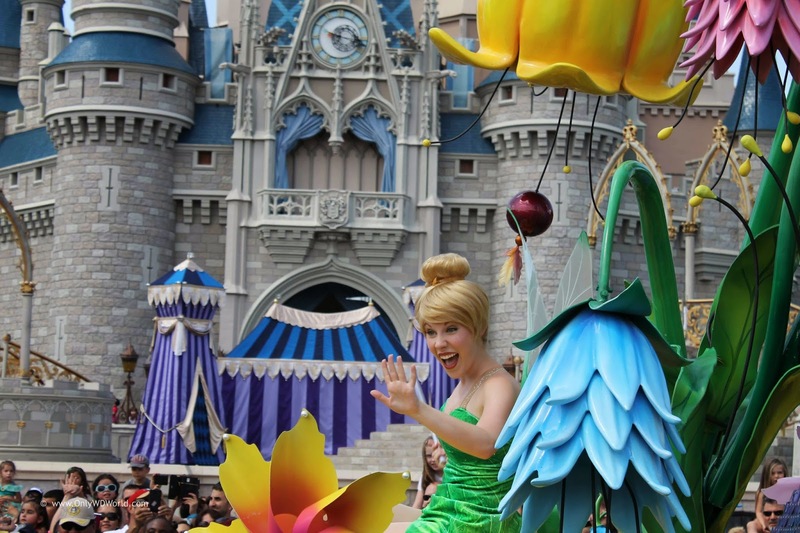 Tinker Belle shows off her personality riding at the back of the float. 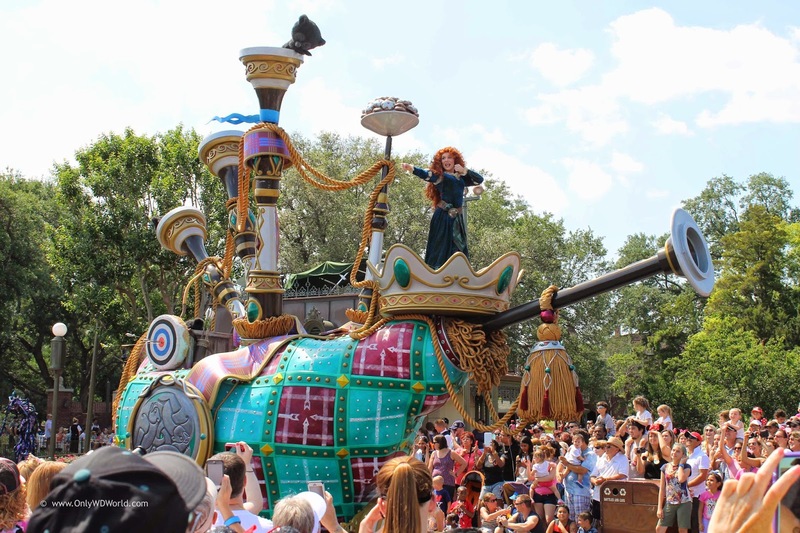 Disney's Brave is well represented by the giant bagpipe shaped float that Merida rides. 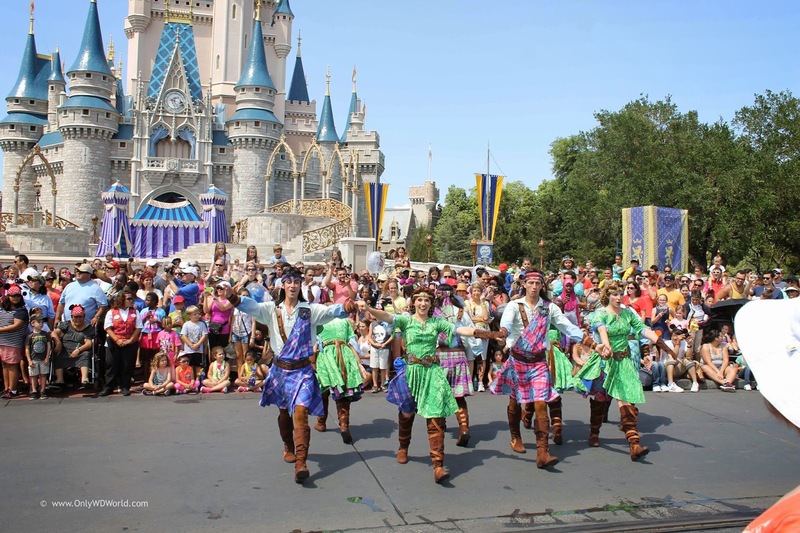 The float is preceded by a number of dancers in Scottish costumes that look great. 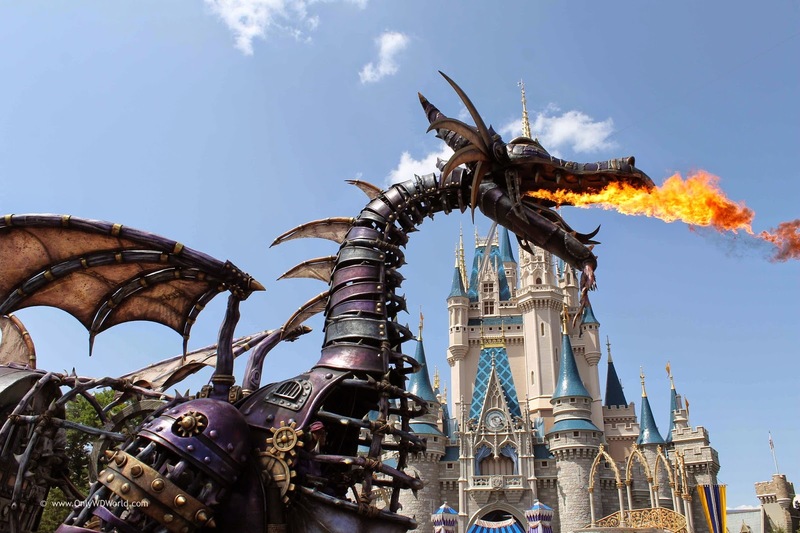 How often do you get to see a fire breathing dragon right in front of you? 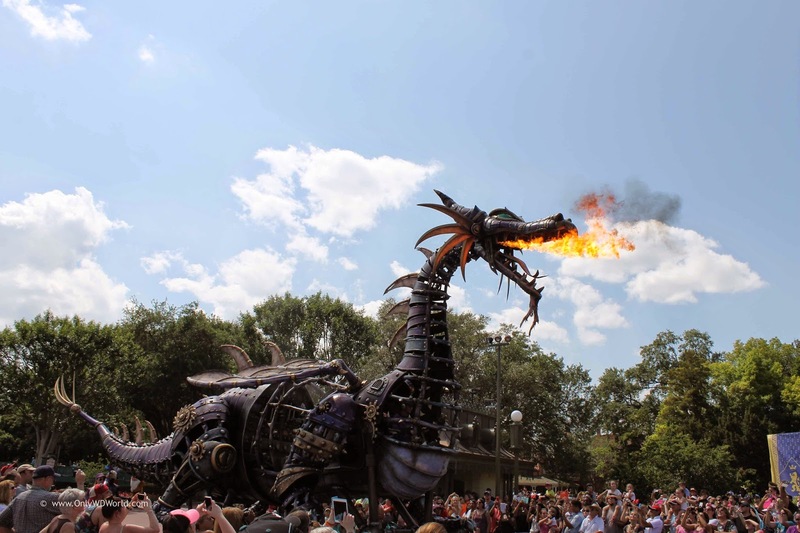 This steam-punk interpretation of Maleficent in dragon form gets everyone's attention as it stops, raises its head, and shoots flames into the sky. 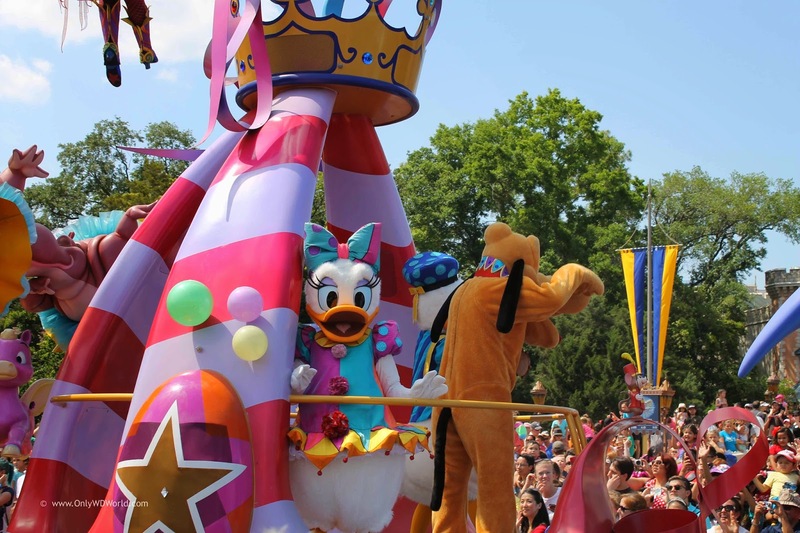 Last, but certainly not least is Mickey Mouse along with friends Minnie Mouse, Pluto, Donald Duck, and Daisy Duck. 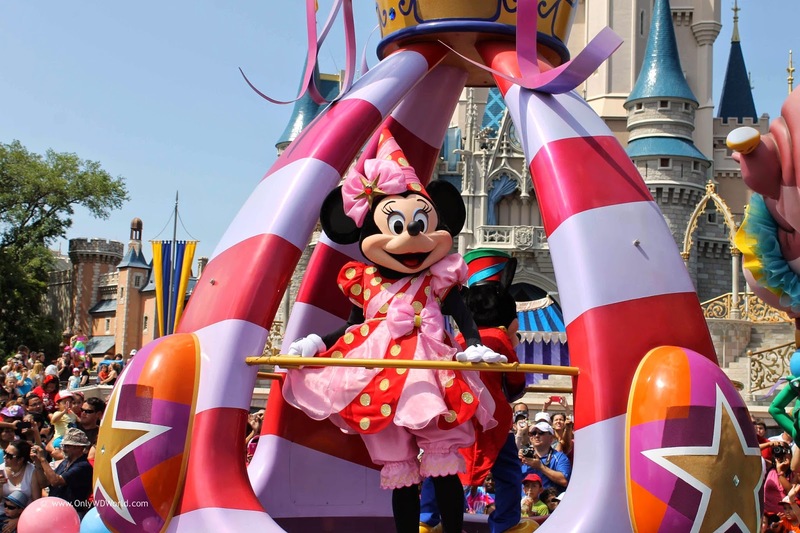 Add in some whimsical effects that pay homage to Fantasia and you have found a great way to wrap up this tremendous parade. 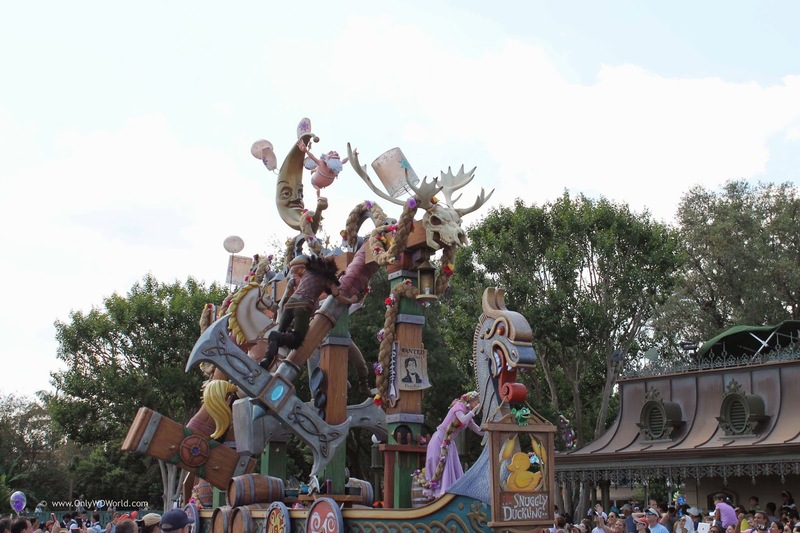 The Disney Imagineers have outdone themselves with what should be recognized as the best Disney afternoon parade ever. 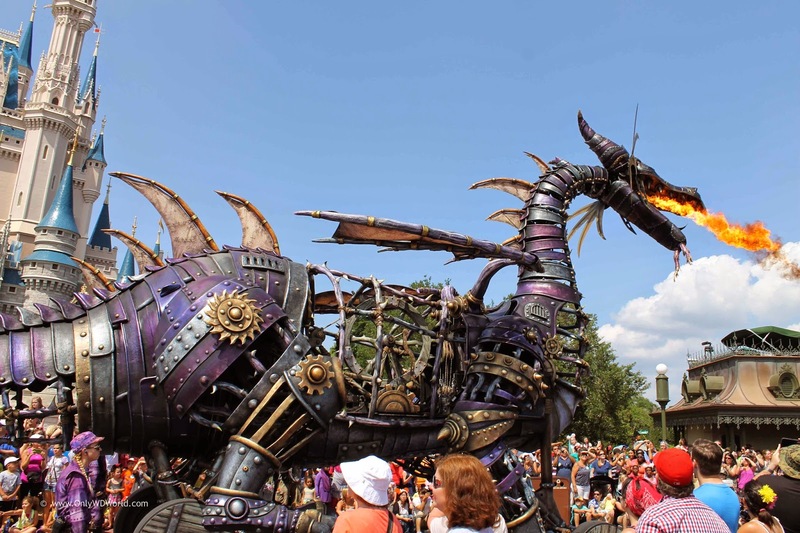 Send us your comments about the Festival of Fantasy parade! 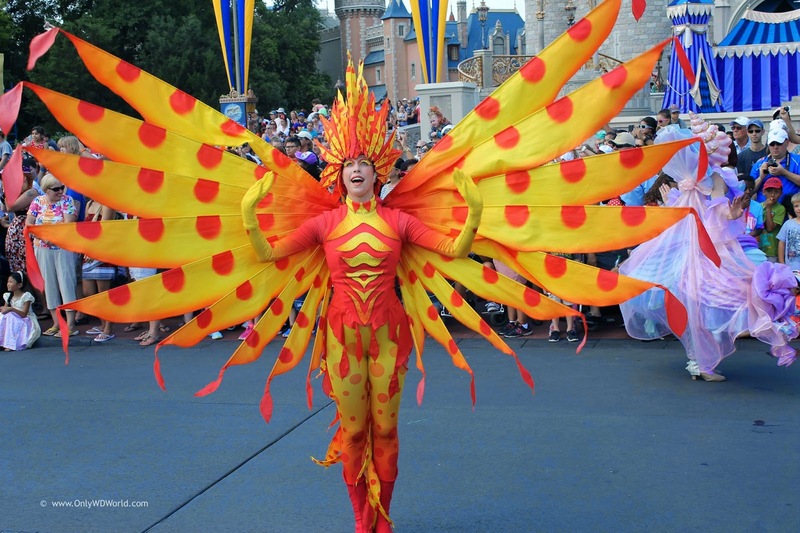 0 comments to "Festival Of Fantasy Parade at The Magic Kingdom"